Math Dictionary-Z deals with words starting with the letter Z. The axis which is perpendicular to the plane determined by x-y axes at their point of intersection. 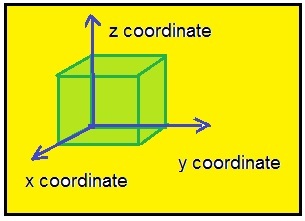 It also represent a coordinate in the triple ordered pair (x,y,z). The point at which the graph intersects the z-axis. The number 0 which indicates zero quantity, size, or magnitude. Zero is neither negative nor positive. The only vector that contained on the point is zero vector. A vector with magnitude zero. Rational zeros theorem gives the possible rational zeros of a polynomial function. Equivalently the theorem gives all the possible roots of an equation. A matrix which having only zero elements is called zero matrix. If a x b = 0 then a = 0 or b = 0. "Mathematics, without this we can do nothing in our life. Each and everything around us is math. We will update regularly this page Math Dictionary-Z . We welcome your valuable suggestions. Please use the box given below to express your suggestions.